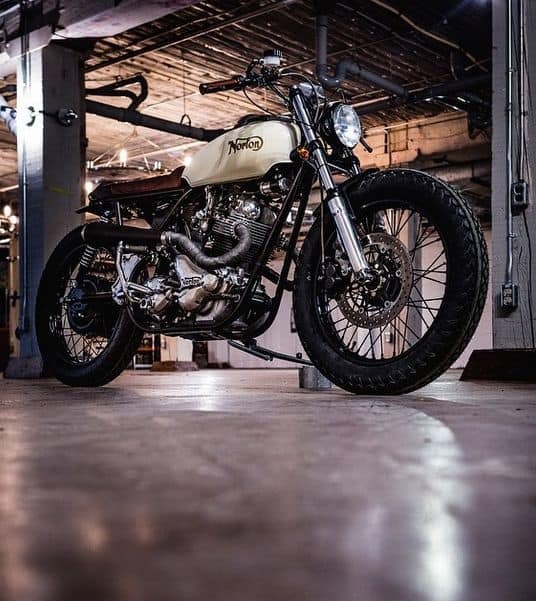 When you think of Canada, I am sure you have passing images of Mountie’s, Moose, and the Stanley Cup in any order, well, we head on over to Edmonton, named after the City I was Born at in North London, this city has a huge passion for Motorcycles. You know when you are in that part of the globe when someone asks if you have a Loonie, you may think its a term of insanity ? Until you realize it is their Dollar coin that has a Loon bird on it. Where’s the largest expanse of urban parkland in Canada? Nope, it’s not in Vancouver. Edmonton’s North Saskatchewan River valley parks system takes that title with a total of 7,300 hectares (you could fit about 18 Stanley Parks in there, if you squashed them). In fact, 20 back-to-back parks make up the system, which spans along both sides of the river (itself winding through the middle of the city), making this capital a whole lot greener and natural than you may have thought. 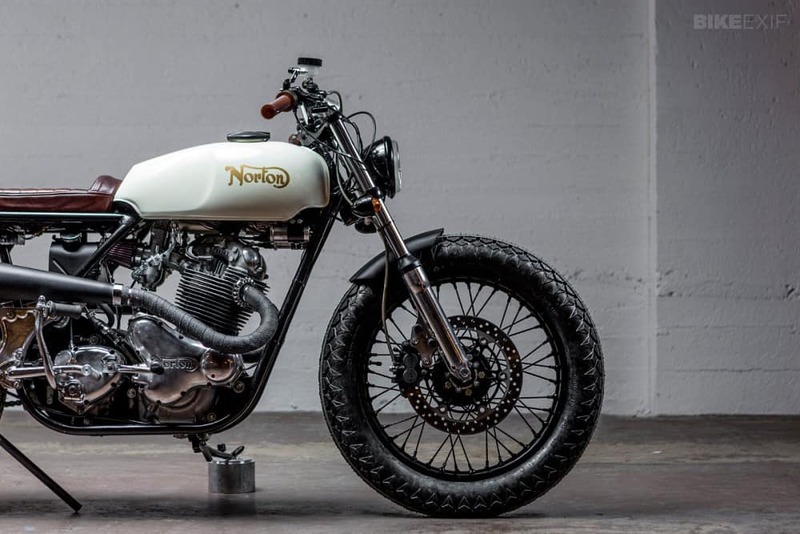 So, a perfect place for a bunch of lads named, Shaun Brandt, Randy Venhuis, and Justin Benson, of which formed their Custom Fabrication shop named Federal Moto, and a while ago turned out this amazing 850 Norton Commando. They just wanted to try something a little different, and over in the MAPLE country there seems to be tons of Japanese Motorcycles scattered about like mattresses on the 5 Freeway here, so- they wanted to try and go with a little more Nostalgia, a bit of Brit style, seeing as a lot of their Dollar Bills still have the Queen plastered on them, they thought they would go an older style route and see what they can come up with using this old Commando as a build platform and a good challenge for these guys to see what their skill set level could accomplish. 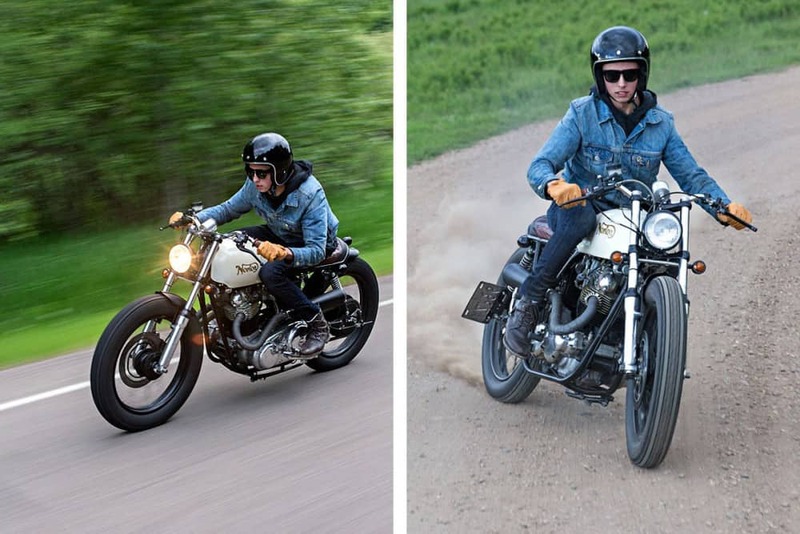 I think many restorer’s will want to kick them right in the Rocky Mountains for cutting one of these Birmingham flyers up, but, on the other hand, there would be even more people loving the hell out of this unique machine and I for one am one of them. 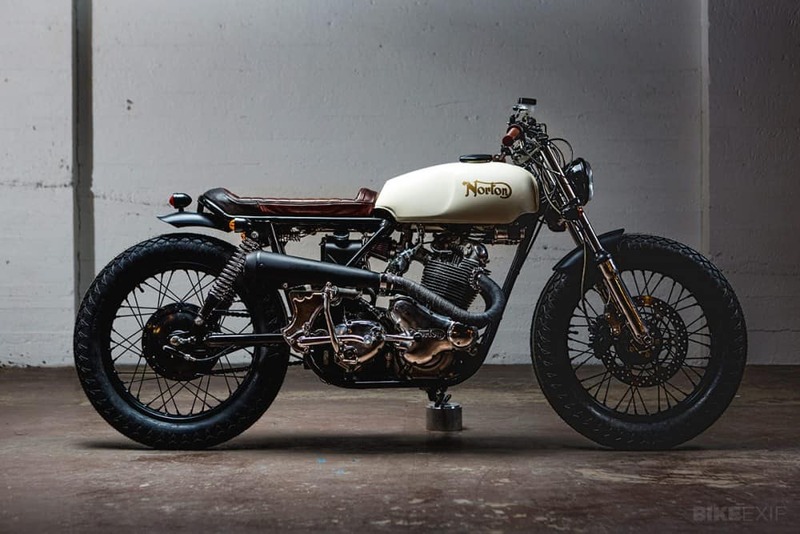 This is a killer looking ride that to be honest James Lansdowne Norton should of created as I for one would be all over one of these. It takes way more thinking out of the box I believe, when you attack an Old Empire two wheeled machine and there will be many hours of head scratching and screwed up post it notes to even try to figure out where this bike is going to go creativity wise. The Ace’ is a 1974 Commando that was discovered on a farm in Rimbey, Alberta, the bike did run but was about as reliable as a BSA, but the bike already had a hearty attitide and the look that the team of builders were after seemed to steer towards a Brat- Scrambler, a cool bar Hopper with an old look that could be ridden to the beach or up into the Mountains and handle the terrain with ease. 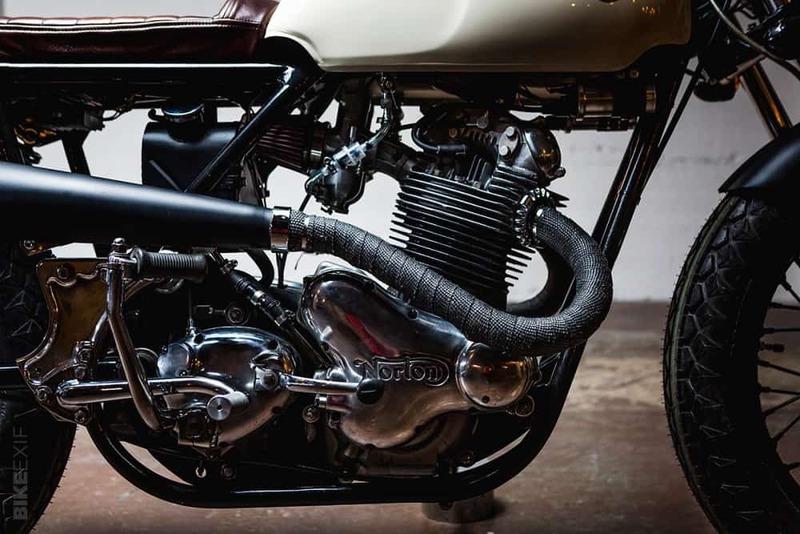 So it was decided that this was the route to take, they wanted to keep the heart of the bike, the Motor, as it was from the Factory in 1974, but the rest was all up for ideas and changes and so the Journey began. 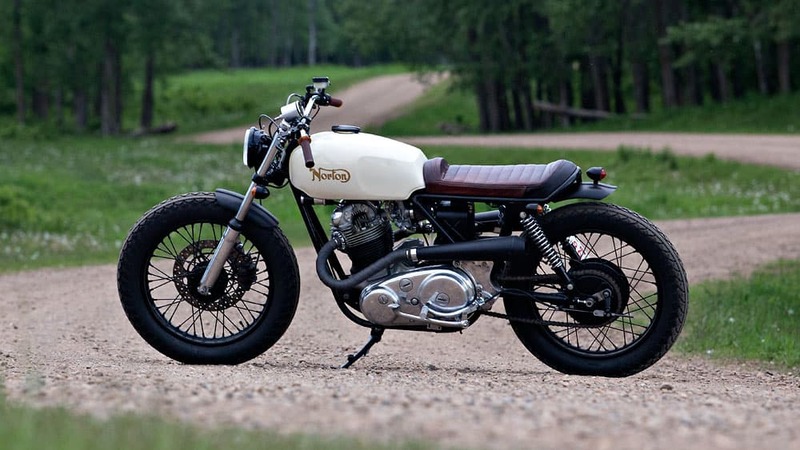 As the Idiom states, – Mighty Oaks from little Acorns Grow- and this was certainly the case with this 850cc Steed. The Bike was stripped faster than a Crook being caught at the Border and before they knew it the Skeleton of the Commando was staring right at them, but that frame? It has the thick center seam that all Nortons are known for, this really needed to be thought out as a back bone such as this would spoil the lines of the current project, so some major engineering calculations was required to be able to pull off something that was aesthetically on the money! Running out of Cigarette packets to draw on, they had to come up with a workable conclusion, somewhat flustered and tired, these guys managed to come up wit a very cool modification that not only gave the lines of these machine a more elegant style, but it kept the rigidity that the original was designed to do. the frame was actually shortened by 18 inches or 457.2 mm for the Metric fans out there. Then a 1 inch -065 wall cold rolled steel tube was hand bent to make the hoop to tidy the back of the frame up and the beginning of this Brat-Tracker motorcycle was now well underway. They pulled that off by going for a set of 19 inch rims and shod with a set of Vintage styled Coker tires and I have to agree it does look the Status Quo. The frame had all the tabs, brackets and nick knacks that were not going to help the machine handle or go faster, cut off, then sanded to a smooth finish, and Powder Coated Black, the bike actually had about 30 pounds or (13.6078) Kilograms removed, so now this Norton will feel so much better in the bends. For a stylish look, a 1971 Oil tank was located and brackets were fabbed to make sure that this fitted like a factory piece, then a seat pan was hand cut, rolled and shaped to engulf the chassis with a Historic style that even the restorers may even crack a smile too. Such neat lines on this Motorcycle. The Mudguards are mid-50s Triumph items rescued from a junk pile, reshaped and finished in matte black and the exhaust system was another great little detail of which they located a set of 1971 Commando SS pipes and then removed about 12 inches from them and added an Old style reverse Cone Megaphone Muffler to give that Olden days gone by feel and of course sound. The Motor itself was not bad at all, considering it had sat around for some time, but none the less, you go this far, well, in for a penny right? So Federal pulled it apart and inspected, cleaned and polished everything. They got the valves dialed in, bored the pistons, and replaced the piston rings. Salvageable parts were sanded and polished in-house, with replacement items sourced through local guru John Oland. 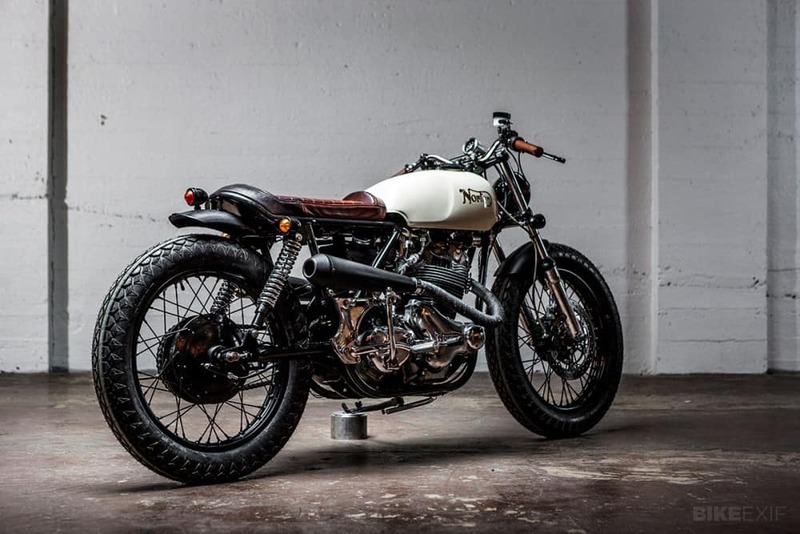 “This build would not have been possible without John’s willingness to share his knowledge of vintage motorcycles. 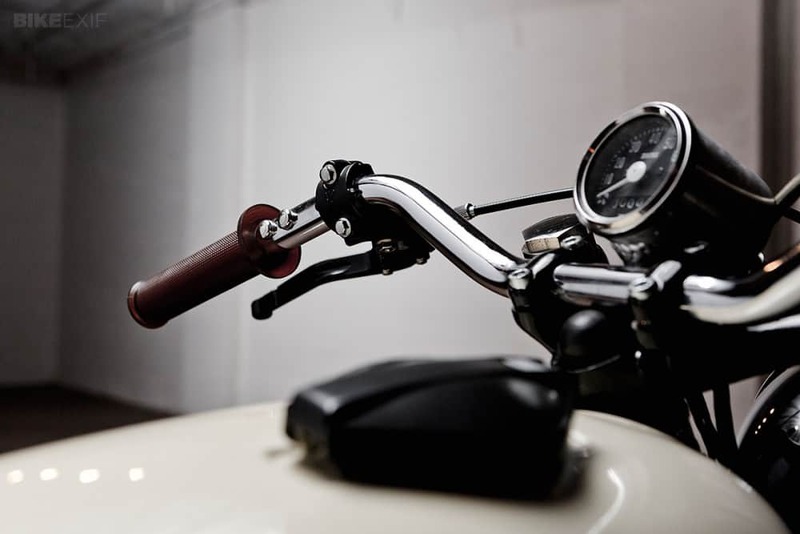 The guy is a legend,” says Brandt..
Small bullet style turn signals were chosen and kept as minimal as possible, anything with switches, as old Brit handlebar controls were big and bulky, so they chose to go with another route and drill and fit small Micro switches and this is so tidy and looks a Million dollars. With a reworked wire harness, and a 5-3/4 Bates style headlight that was fitted as low as possible, gave this 2 wheeler a real classic stance. 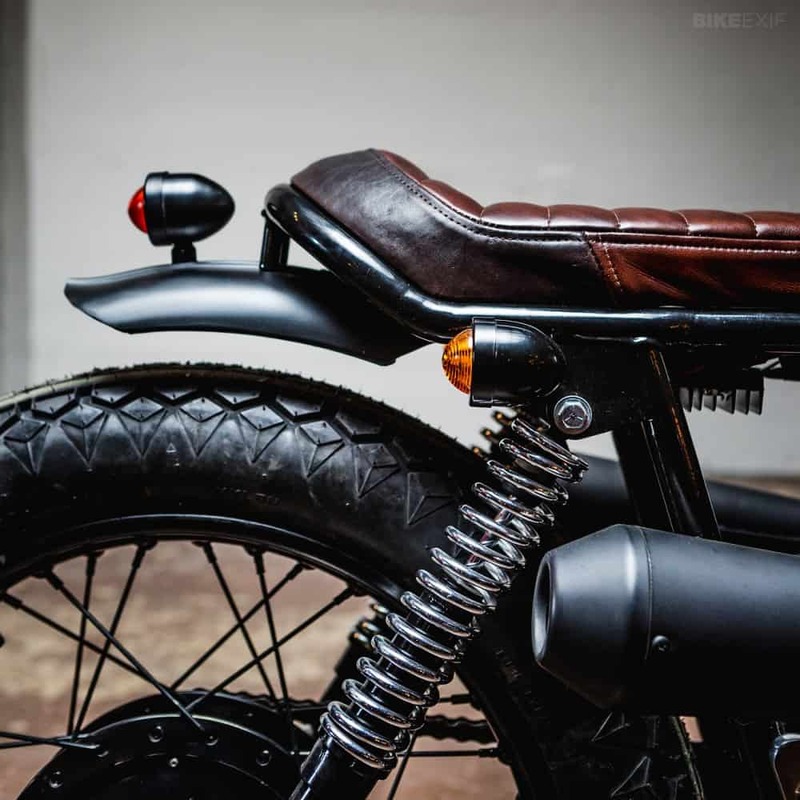 Using a small anti-Gravity 4 cell battery, kept the bike away from any Bulky items and was placed neatly under the seat unit,and helping the steering, a super Low set of A10-A65 bars were placed on top of the yokes. Another neat touch was the grips, as they were purchased from Tommaselli in Italy and used the Natural Gum series , a good choice. They figured out a Tokico two-piston assembly and a Katana 750 rotor—machining a new mounting bracket for the forks. 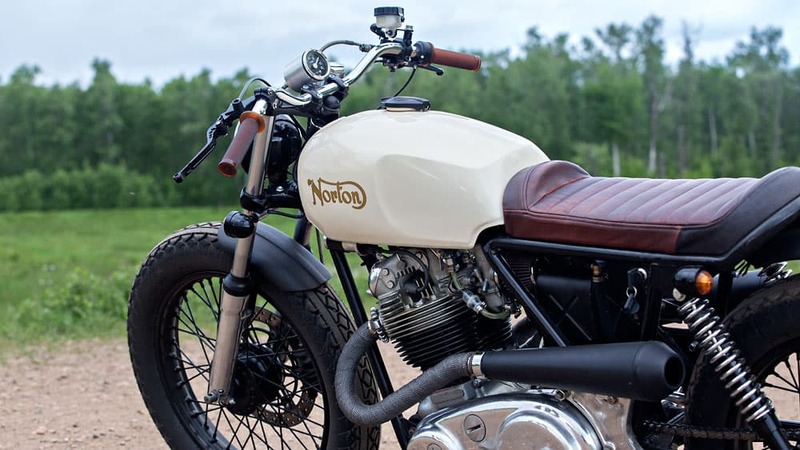 And now this Norton will do like many do not, and thats stop, real quick!!!! 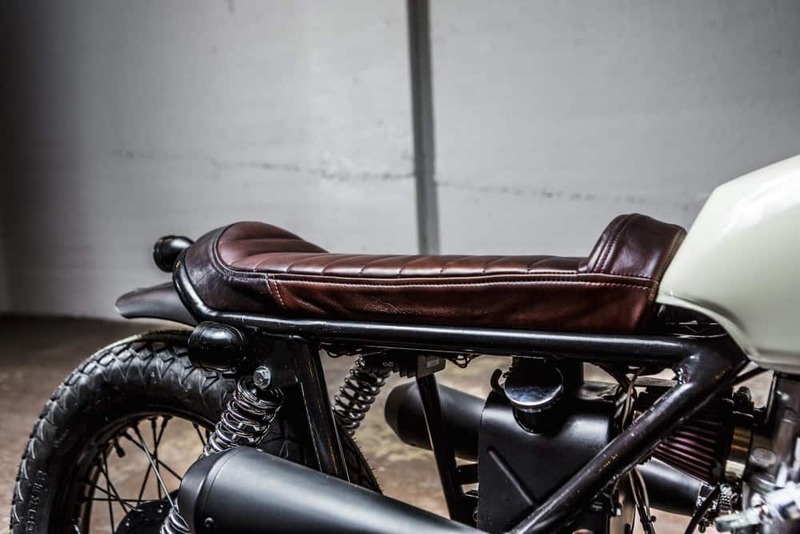 I personally like the 2 Tone leather application to the seat pan, that really does give this creation a touch of Elegance and form, and I take my hat off to that, although the rear mudguard is short. It will stop the road grim from sending a line up your back but it may build up behind the motor as there is no guard liner, but looks great none the less. The Gas tank was painted an off White and the famous Gold logo was added to give the bike its Original Brand back once more. A super fun machine that if you secretly asked the old boy restorer’s,if they would dearly like to ride this around their town? I am certain. 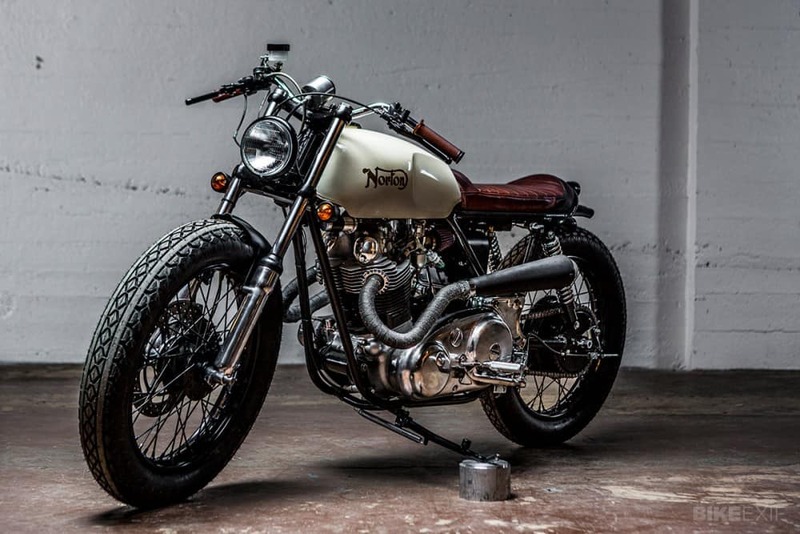 They would be nodding their heads in excitement as it looks like a fun machine that Mr Norton should of had a go at manufacturing and with that I leave you for today and hope that this December day this Blog gave you a little bit of Summer and inspired you to get in the garage and have a go on your Motorcycle. Blogs take me quite some time but I am sure that some of these will get some of you out there, all fired up to create a unique creation that you can be proud of and show people that this is what turns your dial too. 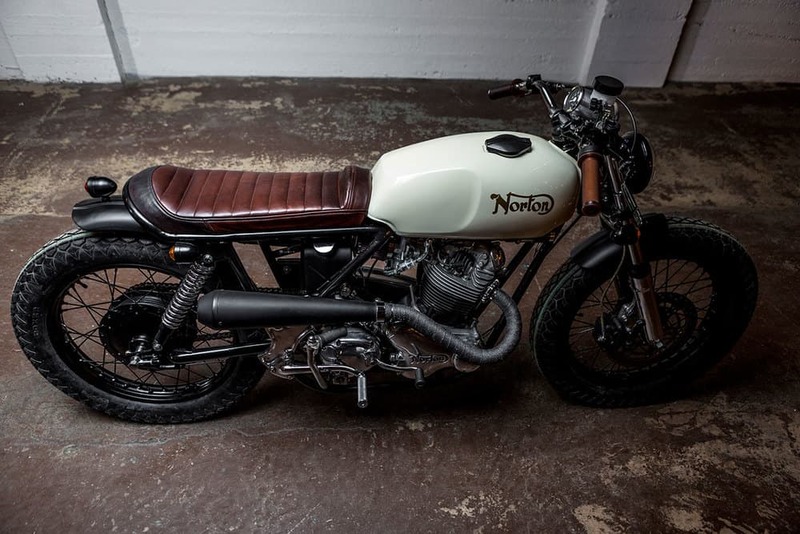 Thanks again for reading my Blogs at Carpy’s Cafe Racers and, if I can help with parts to full builds, just let me know OK. 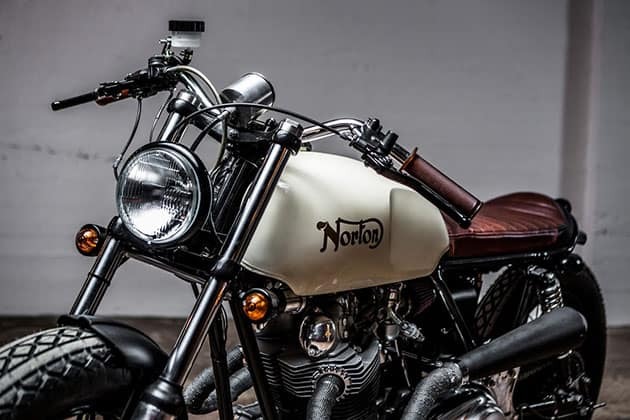 This entry was posted in Blog and tagged 850, bar hopper, Bobbed, brat, brit iron, Canada built, Coker, Commando, custom motorcycle, Edmonton, Federal Moto, hand built, Home grown, norton, scrambler, shed created.